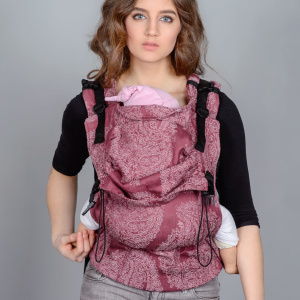 Diva buckle baby carrier: how to wear on your back. 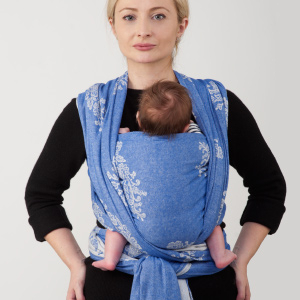 To carry a baby younger than 5 months you need to use a newborn insert. Each carrier includes an instructions leaflet with photographs and detailed description of each carry. Additional instructions for "The One!" Wrap Conversion Buckle Carrier. Front carry instructions for a Diva buckle baby carrier with crossed shoulder straps. 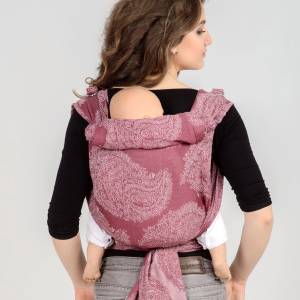 The Diva buckle carrier has an adjustable hood which can be also used as a headrest. No need to take off the carrier when the baby is out and gets back in again frequently.